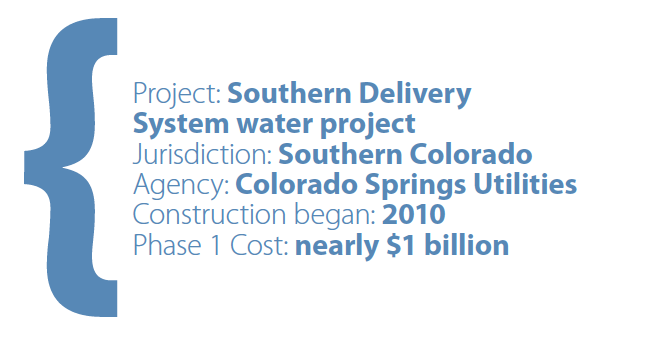 The Southern Delivery System (SDS), one of the largest water projects underway in the western United States, is a regional project that will deliver water to four southern Colorado communities. The project, lead by Colorado Springs Utilities, will bring water stored in the Pueblo Reservoir, located on the Arkansas River, north through 50 miles of pipe to Colorado Springs and its neighboring communities – Fountain, Security and Pueblo West. The first phase, estimated to cost nearly $1 billion, will be completed in 2016. Taking some 20 years to plan and permit and six years to construct, the project has required transparency, communication and public engagement. The project team has met with and presented to hundreds of community leaders and civic groups. The public is kept apprised through a website devoted to the project, as well as through newsletters, local news coverage and social media. In June 2011, the project team prepared to lay pipe through Pueblo West, a community of about 30,000 residents. One of the most complex phases of pipeline construction, the Pueblo West segment required the installation of 6.4 miles of 66-inch- diameter steel pipe through more than 125 residential yards. Additionally, five homes were acquired and required demolition. To keep residents safe and informed, an integrated team of SDS staff and MWH Global, the program manager, appointed two “construction facilitators,” who were continuously on-site at the construction areas and served as a daily touch point for residents and businesses. Through door-to-door visits, meetings and phone calls, the facilitators explained the project and what residents could expect. As work progressed, residents received ongoing letters, emails and e-newsletters to keep them apprised of issues ranging from road closures to plans for yard re-vegetation. Facilitators also distributed door hangers and staffed a 24-hour hotline. Throughout construction, neighbors were invited to learn more at coffee chats and open houses. Even the acquired five homes became a community asset. After the project paid for the owners to relocate, the SDS team offered reusable items – such as plumbing fixtures, cabinets and doors – to the local Habitat for Humanity office to resell or install in its homes. 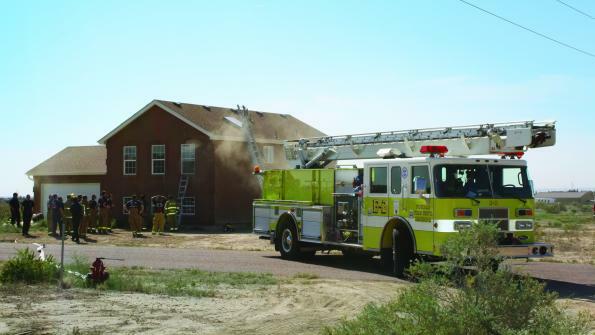 Local fire and police departments were invited to use the houses to conduct drills and practice firefighting. By fostering community cooperation, the SDS team kept residents safe, minimized disruption, and helped the project remain in compliance with permits. That approach is paying off. SDS will be completed on time and is currently projected to be nearly $90 million under budget.